LOCATION This impressive, semi-detached period property is located on the ever popular west side of Horsham, only a short distance from Horsham town centre, main line station with easy links to London and the fantastic Horsham park with Pavilion Leisure Centre. Horsham’s busy town centre boasts a host of independent and national retailers, as well as a John Lewis At Home store and large Waitrose. This attractive location means this semi-detached house is within walking distance of Greenway Academy, Trafalgar Community Infant School, and Tanbridge House Secondary School. PROPERTY The front door opens into the Hall which has stairs leading to the First Floor and a door opening into the impressive Dining Room, which has maximum measurements of 15’8 x 13’9 and period features which include a ceiling rose, stripped wooden flooring, original doors and an attractive cast iron fireplace. Doors open to both the Kitchen and Living Room, which has more original feature such as a box bay window, and picture rails. The Kitchen has been recently replaced, with space for appliances, but has quarry tiled flooring and a door leading through to the Utility Room and WC. 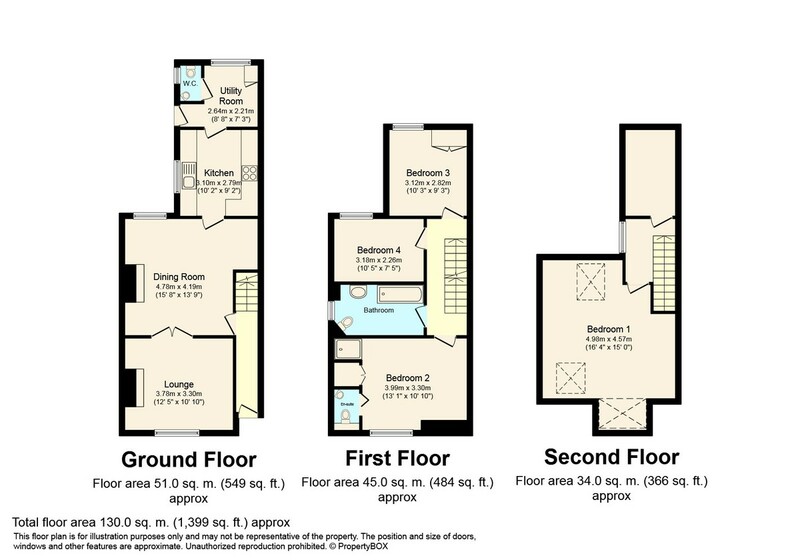 To the First Floor is the Family Bathroom, with a window and three of the four Bedrooms, with the largest having a WC and Shower Room. Completing the accommodation is the largest Bedroom which is located on the second floor and measures 16’4 x 15’0. OUTSIDE To the front of this period property is a well kept, walled front garden, which could potentially (stpp) be turned in to an off street parking space, something which the neighbouring property has already done. Gated side access leads through to the Rear Garden, which has a generous patio, perfect for barbecues in the summer months, leading on to an expanse of lawn with attractive borders, ideal for children to play. At the bottom of the garden is a shed which provides additional storage.